One Third is back on the scene and they are better than before! In fact, so focused are they, that they relinquished what they say was 'poor management' and say they are determined to re-assemble a management team and move forward. The first step was releasing two incredible songs, Memories and the remake of the (UK group) Foreigner's powerful rock ballad, I Wanna Know What Love Is. 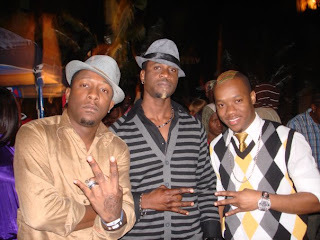 The group which comprises of Al, Adrian and Miguel rose to prominence a few years ago after winning the 2006 Digicel Rising Stars competition [Jamaica's Version of American Idol]. All eyes were immediately on these ultra-talented men who proved that with superb voices, phenomenal stage presence, the sky was the limit. Al, who is from Portmore, St. Catherine, started his journey into music during his time at Excelsior High School in Kingston, Jamaica. With his smooth, crisp, clean, clear tenor, ease at singing falsetto and his effortless cool deliveries, Al has a hypnotic control over his female audience, and because of his trademark of appearing in hats, he has been branded the "ladies-man". Al is destined to take another step up the rung of the music industry. Adrian, a native of Belfield, St. Mary, has a gospel-influenced, soulful lower vibrato-tenor. No one breathes soul into Reggae like Adrian does; as such, he has found great favour with ladies of all ages. His youthful appearance attracts the youngest of fans, and his seemingly innocent persona has piqued the curiosity of older women. He has traded his chances of a full-time medical career to be with his first love - music. Miguel, a son of Sterling Castle, St. Andrew, made an early entrance into music, when he and his peers created havoc with the desks at Calabar High School in Kingston, St. Andrew, beating them like drums. As fate would have it, his first stint in the music industry was as a drummer. Miguel was however determined to make the transition, with his strong vibrato-heavy tenor, coupled with his politician-like charisma and charm, bad-boy allure and stylish ways; he ups-the-ante with magnetism and effortlessly garners a huge female fan base. Needless to say, One Third is now ready to reclaim their spot as one of the most talented reggae groups out there! The songs are proof: just listen for yourselves!